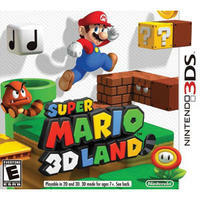 Super Mario 3D Land for the 3DS. Enjoy Mario in a whole new way with Super Mario 3D Land for the Nintendo 3DS. Take control of everyone's favorite plumber as he leaps, stomps, and flies his way through a new adventure in the Mushroom kingdom in Super Mario 3D Land.